Disclaimer: I am an admitted Breadaholic, unashamedly addicted to baking and eating all things yeasty... fragrant, fresh from the oven and frequently slathered with butter. Imagine my delight in finding a newly formed blogging group of bakers, the Bread Baking Society, dedicated to sparking a passion for bread baking across the nation and the world around. Their May focus was focaccia. Check out the beginning post from CakeDuchess and meet the three amazing bakers who began it all. I knew I had to join in the fun yesterday, immediately, that very afternoon, before May ended. My galley countertop held a bouquet of fresh mint and a pot of basil, the fridge stored a plastic bag with half-a-recipe of my usual pizza dough (link), and that was a beginning. I've played with focaccia before, usually with assertive savory topping combinations like gorgonzola, anchovies and spiced nuts. For this effort I planned to use a more restrained hand with the toppings and flavor the dough with fresh herbs. And then I hesitated when it came time to select the toppings. What if we hated something that was too weird or wimpy? Could I handle the disappointment? Caution ruled and I split the half-recipe of dough in half again to make two smaller focaccia ovals. I kneaded 1 tablespoon of fresh basil shreds into the first dough portion, and a scant 1/4 cup of chopped mint leaves into the remaining dough. The dough with basil called for more traditional, Mediterranean-leaning accompaniments. Caramelized onions, kalamata olive halves and a sprinkling of shredded Parmesan cheese topped that loaf. Mmmmmm, good tasting focaccia but nothing special. I'd add feta with herbs next time. The minty dough was the real surprise. Topped with sweetened caramelized onions, pine nuts and a light sprinkle of grated lemon zest, that focaccia rocked! The onion slices had some charred edges, but who cared? Not me. Not RL. Some of the pine nuts fell off as we ate slice after slice, but who cared? Did we even notice? No way. We just enjoyed the distinctly mint-flavored bread with a crunch from pine nuts, the light notes of slightly sweet, mellow onions and tangy, citrusy lemon... OMG it was terrific. Dinner last night featured grilled Merguez sausages and red pepper strips, but we really focused our appetites on that surprising Minty Foccacia. Use your favorite pizza dough recipe, quantity appropriate to the amount of focaccia desired, and knead in some chopped fresh herbs. A half-recipe of my favorite Bonita Atkins pizza dough made two 6x10" oval foccacia. After the first rise, shape the dough and place the ovals (or rectangles) on a parchment-lined baking sheet. Let rise again for about 40 minutes, or until somewhat puffy. Brush lightly with olive oil and sprinkle with sea salt. Add a few toppings if you like, or let it go unadorned. Bake in a preheated 400 F oven for 20-25 minutes. Let cool slightly before cutting - if you can resist. Do you have a favorite go-to salad that you turn to, one you rely on to complement any menu? a salad you can make ahead and hold for hours in the fridge? something to take to a potluck that everyone will enjoy? a side dish to whip up quickly for an impromptu gathering? Broadway Pea Salad tops my list of "old reliables" to fill these requirements. I link this salad with memories of long-ago dinners at Seattle's Broadway Restaurant, and I know the old Clinkerdagger chain featured it on their menu as well, so this is no newcomer to the party. Oh no, this pea salad with its many variations has been a classic standard in northwest galleys for decades. I think it's the winning combination of a creamy dressing contrasting with salty nuts, the pop of the peas and the satisfying crunch of the other ingredients that make this salad so popular in any season. This year's Memorial Day dinner with friends featured a fairly traditional menu of BBQ pork ribs, MexiCorn salad, cambozola smashed potatoes, pea salad, and grilled pineapple for dessert. Wet spring weather meant the ribs were oven-baked instead of grilled, but that did not spoil our fun. Can you guess which recipe a guest requested as I packed up a little take-home container? Easy guess, it was the Broadway Pea Salad. Toss together peas, celery, water chestnuts, onion, bacon, and cashews. Combine dressing ingredients and blend. Add the dressing to the pea mixture, one quarter cup at a time, and toss. Add more dressing and keep tossing until you like the result - you may not want to use all of the dressing. Spoon onto lettuce leaves on individual plates, sprinkle with cheese and serve. Or, mound in an attractive bowl lined with lettuce leaves, sprinkle with cheese and serve. 1. Blanched broccoli stalks and raw broccoli heads are a tasty addition or can substitute for the peas. Then you have a terrific Broadway Broccoli Salad. 2. In a rush? Costco's bacon bits will do as a substitute for freshly cooked bacon. The result is OK, but not quite the same. 3. Too bland? Add some lemon zest to the topping for a tangy pop of citrus. Do these cookies look familiar? They might since they are just one more variation of our favorite Cruising Cookies, aka Cowboy Cookies. When asked to choose, Mike (one of the O.P. shipyard crew working on the boat) requested an oatmeal cookie instead of a recipe featuring chocolate. Easy enough to accommodate, I substituted dried fruit for the usual chocolate chips, added a little coconut and ignored any healthy additions like flax or bran. This variation proved popular at the shipyard, or at least no one complained to the cook. I think the non-chocolate version might become the onboard standard from now on. Add the flour mixture to the butter mixture and mix well. Form small balls, about the size of unshelled walnuts, and pack firmly or roll around until the dough is firm. Or roll the dough into several logs, wrap in plastic wrap, refrigerate and then slice off small coins when you're ready to bake. Place the dough balls on parchment-lined cookie sheets (or use silpats). Bake at 350 F for roughly 12-15 minutes, rotating the pans halfway through baking. Be sure not to overcook or they will get pretty crispy... unless you prefer crisp cookies to soft cookies. *One taste tester swore he could taste apples in the blend. Nope, not in this latest batch, but dried apple chunks do sound like a delicious addition to the mix. This is a dessert I shared with our new neighbors M & D just before we left home and moved aboard. I wish I had taken the time to prepare it last night when N & L came by for an evening visit. But I didn't. Instead I filled my morning in the boatyard with fiddly little projects, then we relaunched around noon and brought the boat back to the moorage. One busy thing followed another and I ran drove to the store to buy dessert instead of baking. We enjoyed the purchased cheesecake, but Oh My! my tastebuds craved another slice of that apple creation instead. 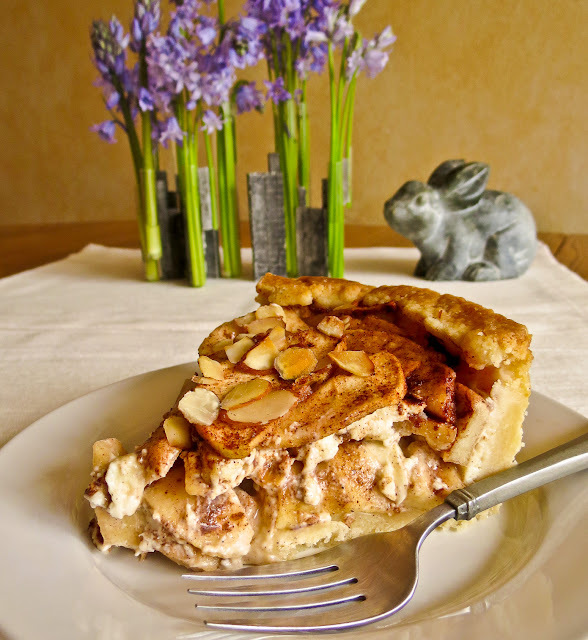 Apple Cheese Torte offers a decadent layering of spiced apples over a creamy custard encased in a shortbread crust. Top that with a sprinkling of sliced almonds and you have something wonderful, the kind of dessert where you want more than one thin wedge. Any one of the layers would be tasty enough by itself; I'm especially fond of the shortbread crust and RL prefers the custardy apple filling. Give it a try and see what you think. The recipe comes from an old Jr. League cookbook that sports a sturdy, practical design. 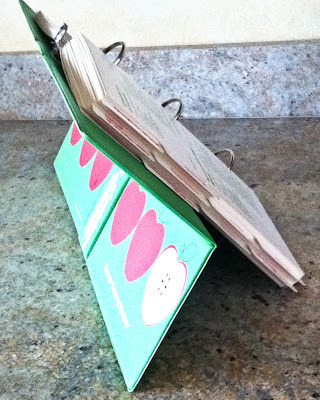 It stands up by itself and both cover and pages are nearly stainproof and spatterproof. That's a bonus in my galley. Add vanilla and flour. Blend well. Press mixture into the bottom and three-quarters of the way up the sides of an 8-or-9-inch springform pan. Beat cream cheese, ¼ cup sugar, vanilla and egg. Pour evenly over the crust. Combine sliced apples with sugar, cinnamon and a little lemon juice. Toss to mix well. 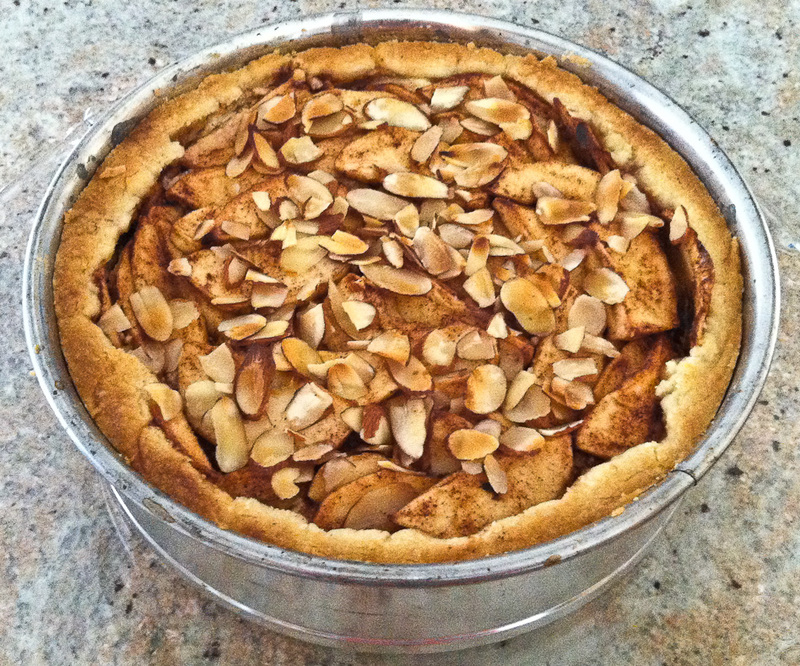 Pour apple mixture over top of cheese mixture and sprinkle with sliced almonds*. 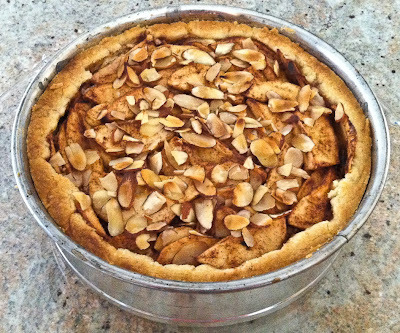 Using a spoon, push crust down on sides even with apples. Place the pan on a center rack in the preheated 450 F oven and bake as directed below. *Sliced almonds tend to burn at high temp, so you might wait and add them after you reduce the oven temperature to 400 F.
Springform pans often leak, and this can be a juicy torte before it sets up, so place a baking sheet lined with foil on the rack below to catch any drips. You'll thank me for this tip when it is time to clean up. RL thinks it’s especially good with a scoop of vanilla ice cream alongside, and I’m fond of a spoon of soft-whipped cream, but this dessert looks tempting and tastes terrific all by itself. Yes, any day now I'll return to cooking real meals. We moved back on board the boat and this week has been full of grabbing a snack or dining out. Not that I haven't been busy in the galley, oh no. I've emptied shelves, inventoried stores, cleaned refrigerator, freezer and cabinets and had all kinds of food-related fun. The sourdough pot sits neglected on the shelf, tempting me to at least bake a loaf or make some pancakes. Instead we breakfast on fruit and cereal, and lunch on salads or fruit with crackers and cheese. A&W, Boston Pizza and the Riptide Marine Pub have provided filling dinners on the nights we didn't skip dinner and fall into bed too tired to eat. I did cook assemble a dinner of ramen with a vegetable stir fry topping, and another night we ate popcorn with Parmesan for dinner, but there are no photos to prove that I ever heated a burner or even turned on the microwave. The boat will be hauled out later today and we'll be living aboard on dry land for several days. That always adds a few new wrinkles to managing life on the boat. Maybe I can come up with a batch of yummy cookies for the shipyard crew as well as a cooked meal or two for the captain. Back in the galley soon - see you then.